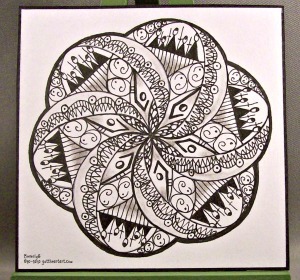 I got Zentangle 12 by: Suzanne McNeill, CZT and Cindy Shepard,CZT this week. I thought I would have time to tangle the square and round templates that Erin gives us to print out, but I see this evening that's not going to happen so I'm going with what I've got. As I was looking through the book I saw some tangles that were very Halloweenesk (probably not a word or spelled correctly). So staying in the Halloween mood, especially since we'll be carving pumpkins tomorrow I present you with: Monsterz, Face It, Condo, Sentry, and Betweed is in the center. That is a very popular tangle with a lot of tanglers. I thought about using color but decided just to stay pure with some shading. Unique approach to this template. I like the little "people groupings". Was not sure if it was a coven or it was angry townspeople. I think I can see you had a lot of fun with this template! Wonderful and very delicate zendala! I like your choice of tangles! Beverly, I love you Halloween'esk' zendala! Looks like you had a lot of fun too! I might have to give a couple of those tangles a try! :0) See you next week! Beautiful! I like Your tangles very much. Great job! Such a fun way to do this template. It's always nice to see some Halloween things this time of year!